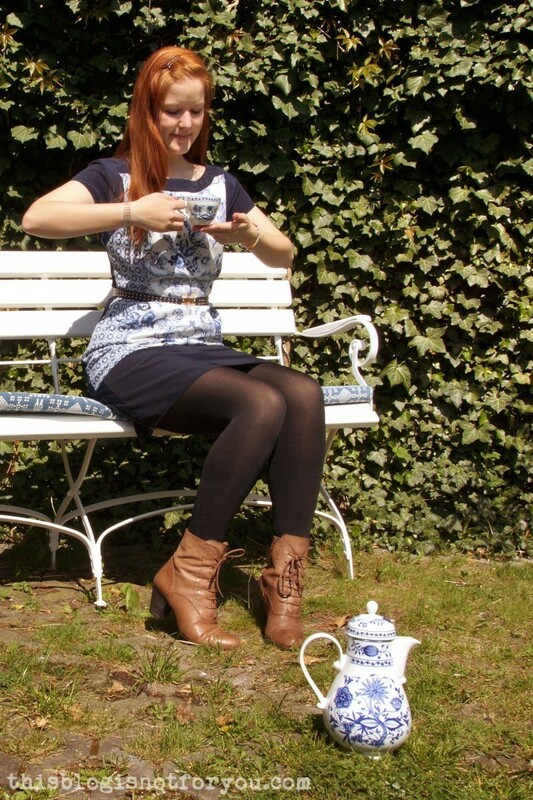 I’m all ready for the tea party, just couldn’t find the rabbit-hole yet. 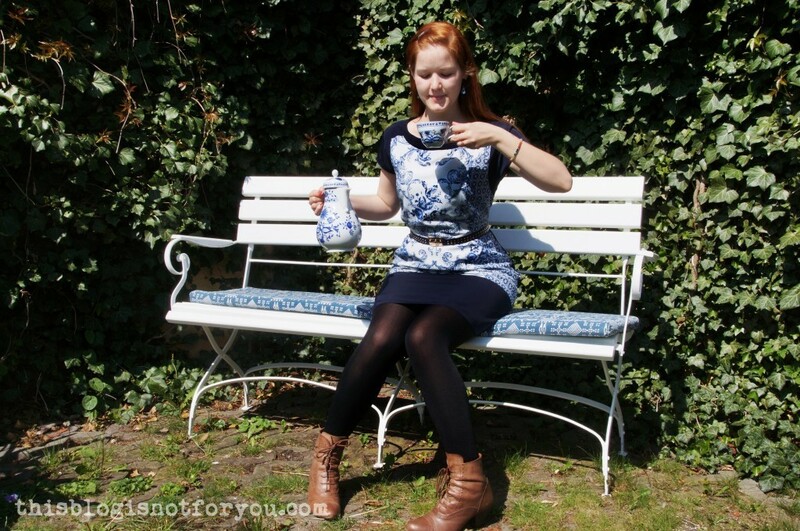 In the meantime I had many cups of pretend-tea while my sister was snapping pictures of me and my newly refashioned porcelain dress. Here’s a before pic of the dress. 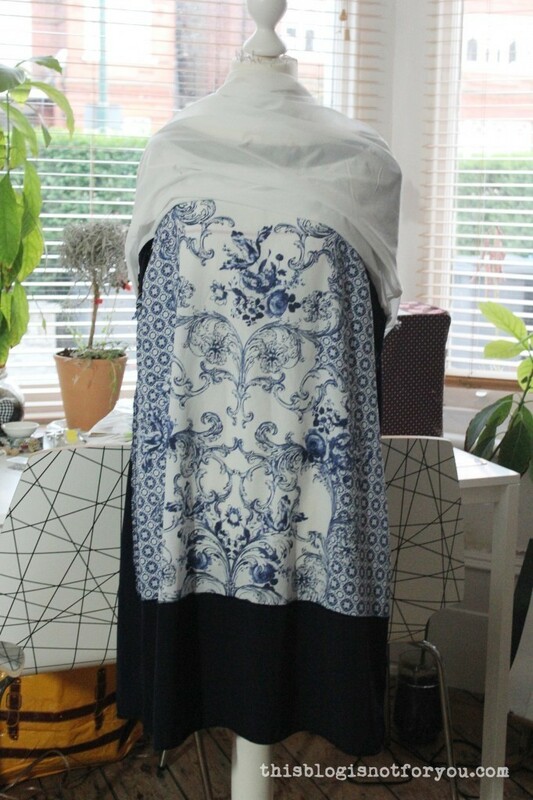 I bought it at TRAID, my favourite charity thrift store, for just a few pounds. 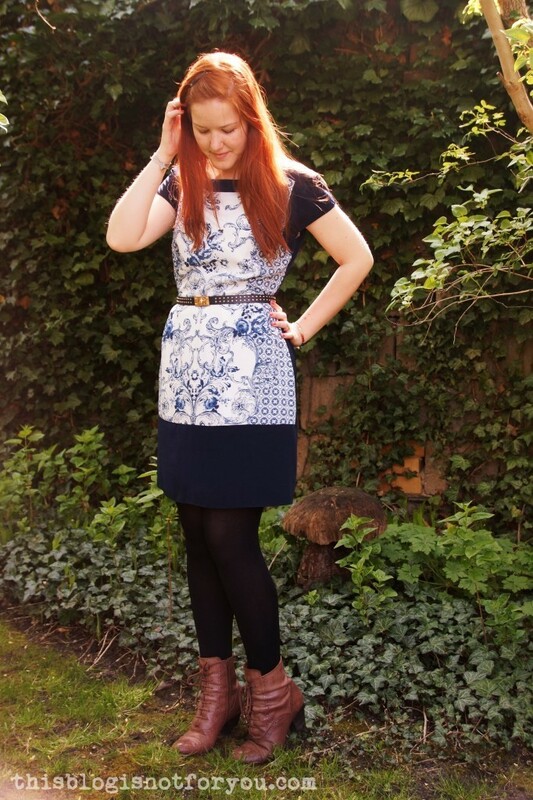 It was a size 20 Dorothy Perkins dress I absolutely fell in love with because of the fabric. 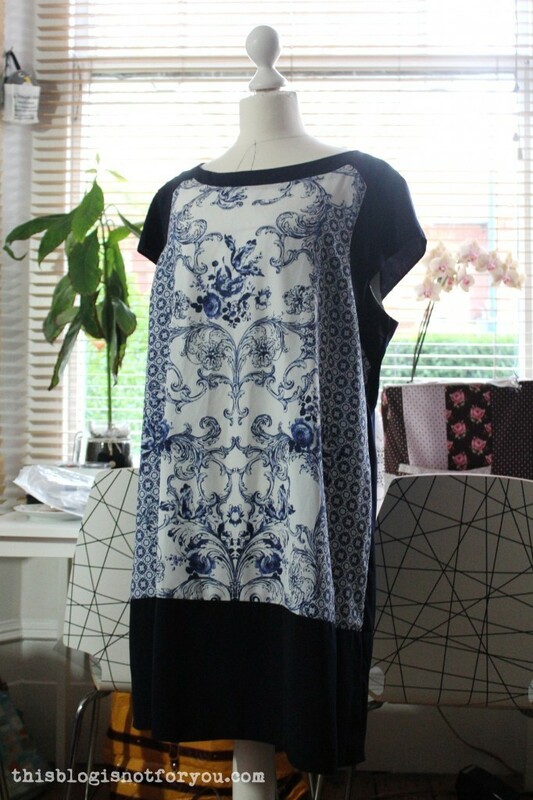 Although it’s polyester is has a very soft and silky feel to it and the print is just fabulous. 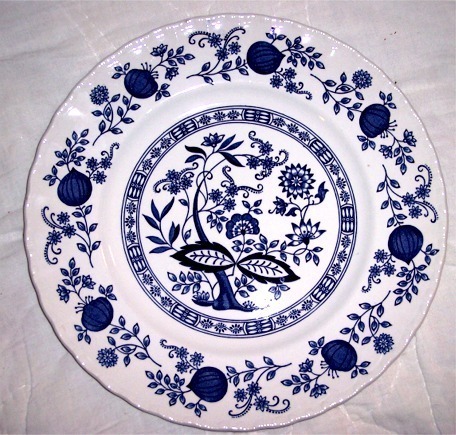 I don’t know if you guys know onion pattern porcelain, this is basically what I grew up with. It’s the sort of china my grandparents had (and still use) and if I remember correctly my parents also have similar china at home. 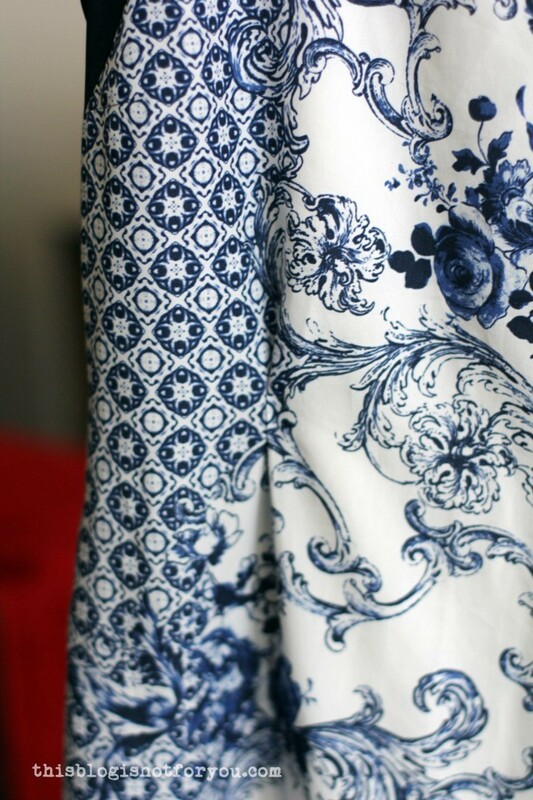 I just love the pattern and this fabric reminded me so much of it (and happy lunches at my grandparent’s place). I threw the dress on my dressform, inside out. Pinning the lining out of the way I took in the sides of the dress, which actually took a bit longer than it sounds. Pinning, trying it on, repeat. Until I was satisfied with the fit. The tricky bit was the fact that there is just a very short zip in the back. I couldn’t take it in too much at the waist as it still had to fit over my shoulders and bust. After pinning comes the fun part: chop, chop! 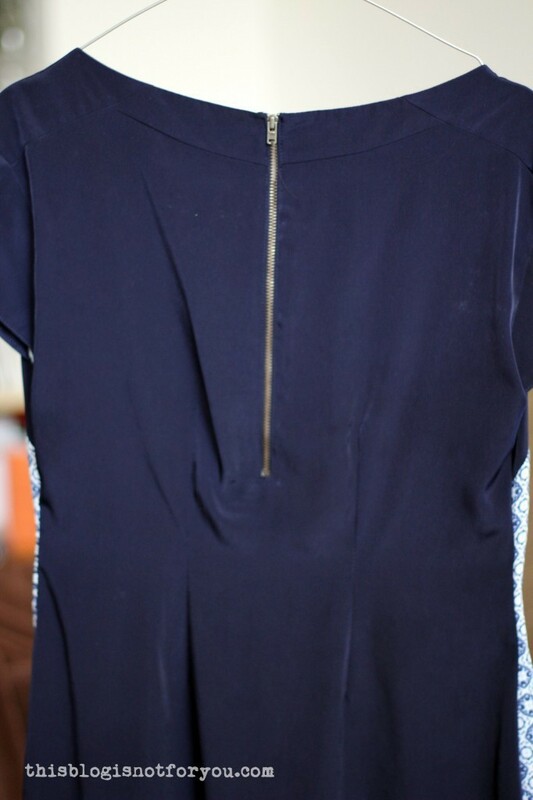 I used the chopped-off bits of the blue fabric as a template for trimming the lining. 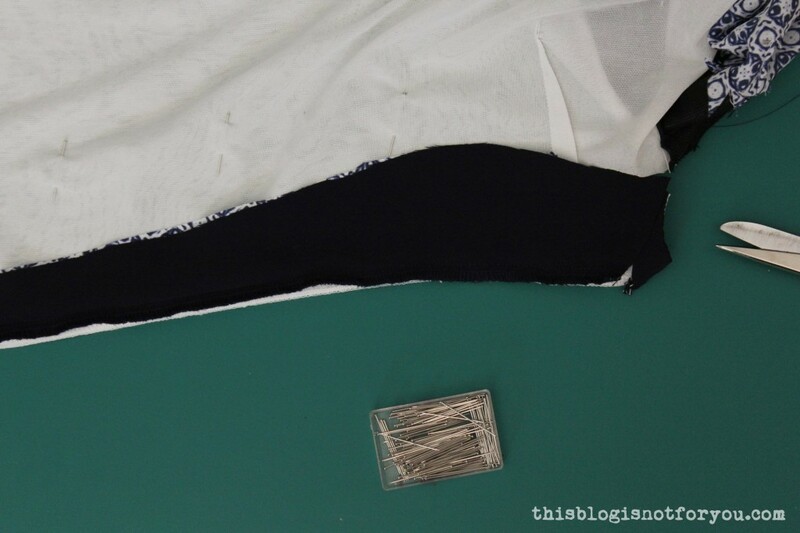 I finished the raw edges of both fabric and lining side seams and then created two darts in the back add more shape. 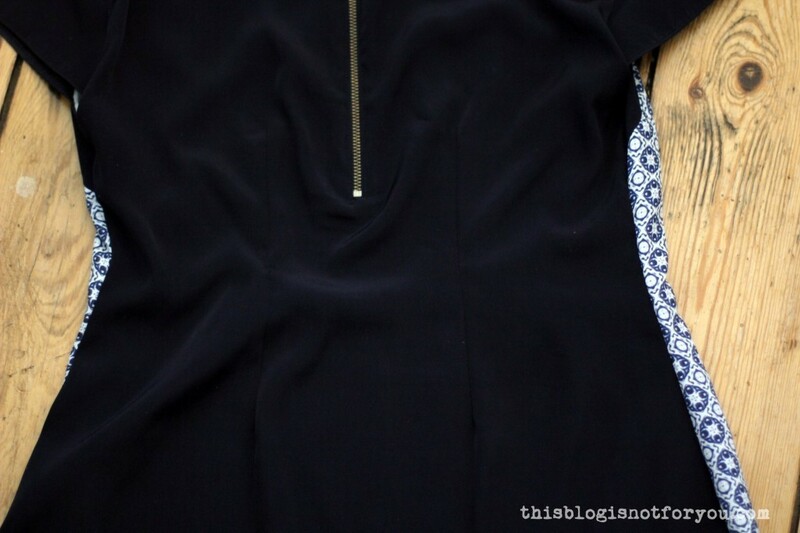 I also created to tucked pleats in the front, which I just quickly sewed down with a few hand stitches. 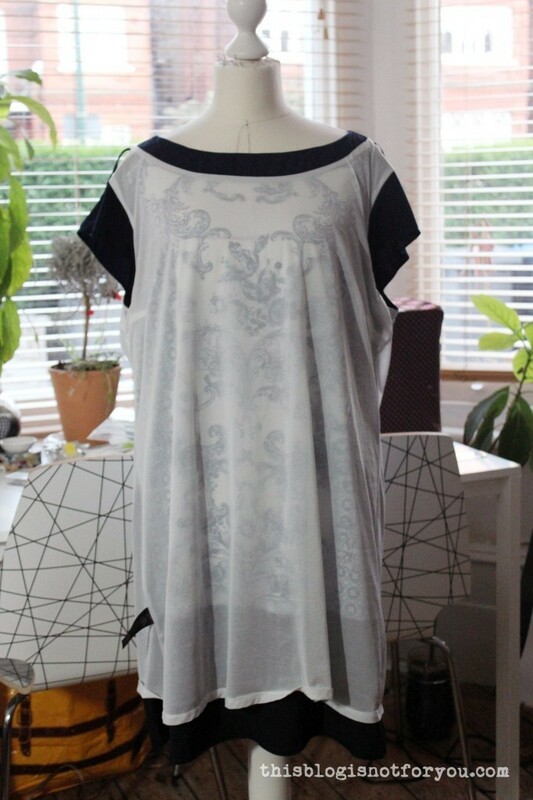 The fabric was very delicate and I didn’t want to accidentally ruin the whole dress with machine sewing them down. 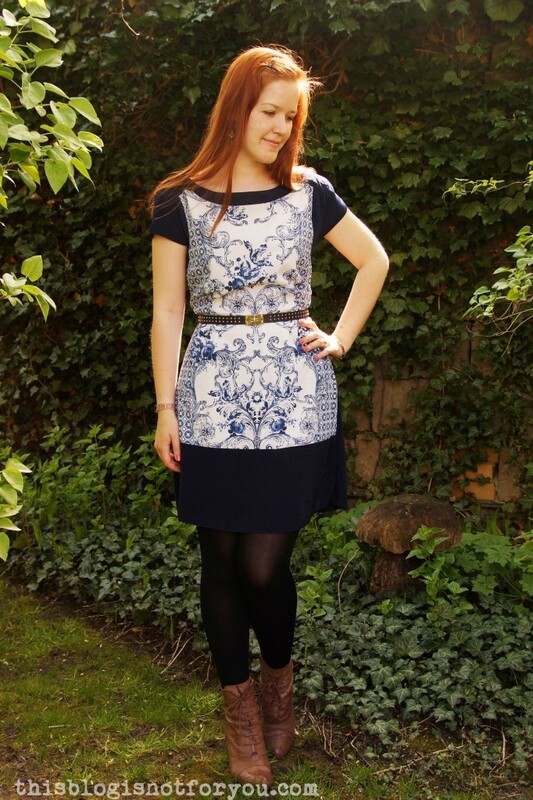 The dress now fits very nicely, but I still prefer to wear it with a little blue belt. It breaks it up nicely and cinches it in a bit more at the waist. 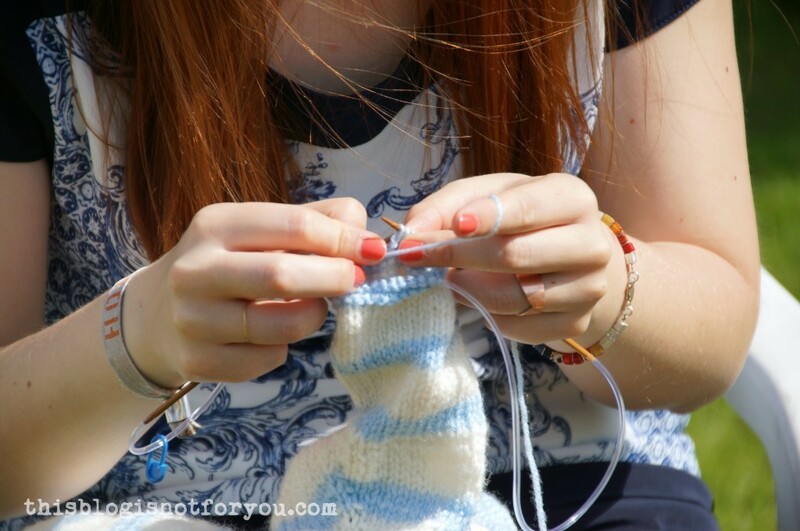 My Dad caught me knitting on a sunny 25°C Easter sunday. Well, I couldn’t fit my sewing machine into my suitcase. Ryanair, meh. 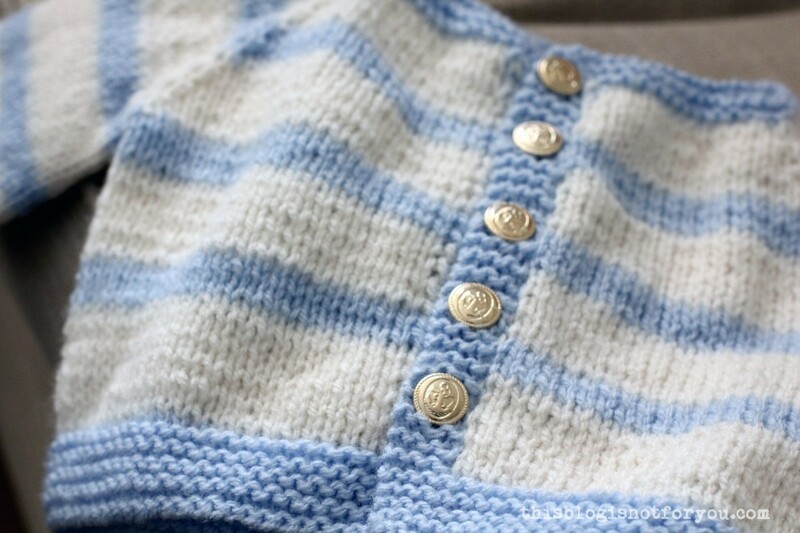 Here’s a sneak peek of the tiny cardigan I was knitting for my mom-to-be sister-in-law. As a soon-to-be-auntie I will have loads of excuses to sew tiny clothes and practise pretend-tea drinking. Ha! Love these pics! Your dress is lovely- and the little sweater!!!!! Your dress turned out lovely. 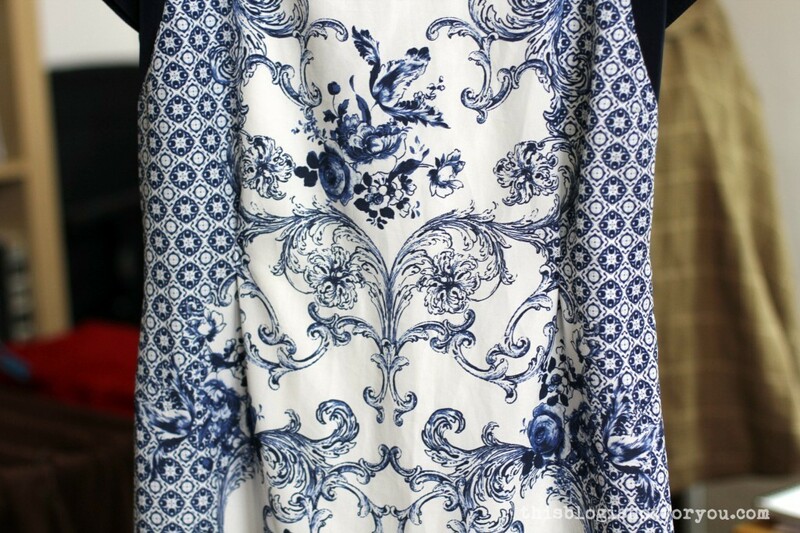 I love the fabric… it makes me want to get busy and find something similar fabric wise. Great job. Thanks Jean! I love the fabric, too 🙂 I’m so happy I finally found the perfect porcelain fabric. Was looking for it for soo long. This is gorgeous! 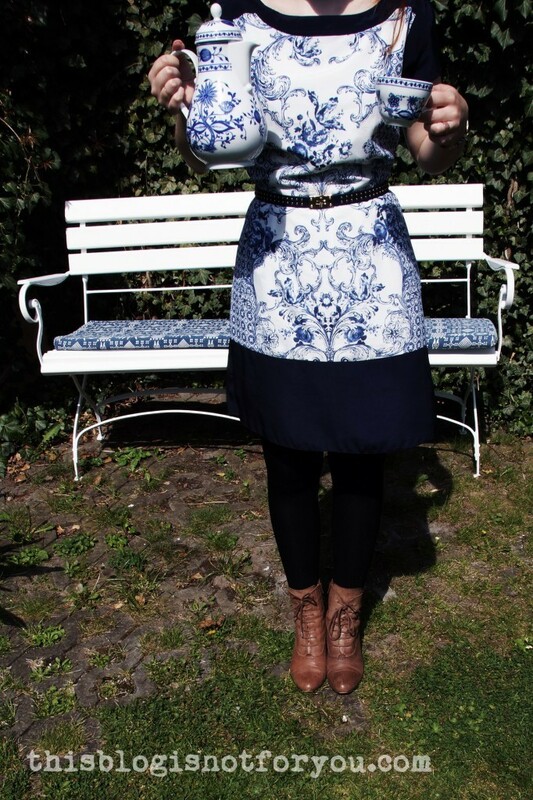 The fabric print is lovely, I can see why you liked it, and what a great re-fashion.